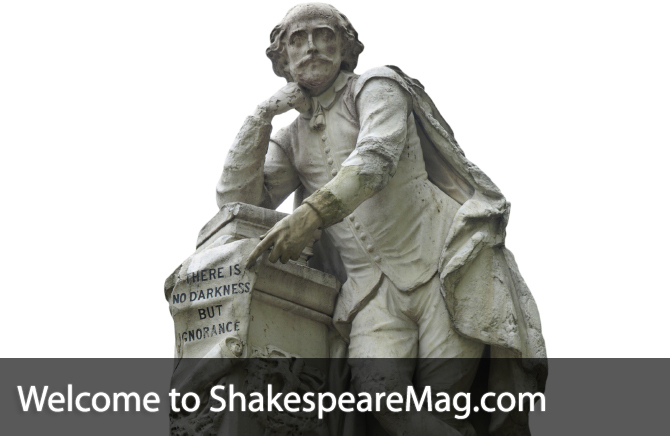 ShakespeareMag.com is an educational and learning resource about the works of Shakespeare and the role and influence they have had on our history and language. From an introduction to the Bard and a history of his life to a full archive of his most important works along with notes on various plays and sonnets, tips on teaching Shakespeare as a subject and much more. ShakespeareMag.com is also pleased to bring you a comprehensive collection of the United Kingdom's Shakespearean theatre companies with details on the history and make up of each one as well as venue, location and contact information. Please have a look through the site and let us know what you think. William Shakespeare has become the most famous and influential author in English literature. Only active as a writer for a quarter century, he wrote thirty-eight plays, one hundred fifty-four sonnets and two epic poems that reinvented and defined the English language to such a degree that his works are required study all over the world. Prolific writer of thirty-eight plays and more than one hundred and sixty poems, William Shakespeare has long been established as the most influential writer in the history of English literature. His works have been translated into every major language and are required study in schools all over the world.